Argentinean farmers have increased their levels of herbicide spraying of crops, and the results don’t look good. A huge increase in cancer incidence is being reported in Argentina linked directly to areas of heavy GMO crop engineering and high biotech herbicide use. The Ministry of Health in Córdoba, Argentina, reveals in a report that deaths from cancerous tumors are double the national average in areas where genetically engineered crops are grown and agro-chemicals are used. As reported, the report has documented five successive years of information on cancer increases in the provinces that are experiencing increased elevated rates. The substantial evidence points to GMO-driven agricultural practices as the main culprit, turning our farm lands into a public health hell. Areas where the most agro-chemicals are used and the most GMO crops are grown – such as the ‘pampa gringa’ area – experience the highest death rates. This area comprises the entire Eastern region of the Córdoba province and is considered a premier agricultural region. The average rate of cancer deaths is 158 per 100,000 in most provinces, but in four of the ‘pampa gringa,’ areas, death rates range from 216-230 per 100,000 – about 1.5x greater than the normal range. Other intensively planted GMO regions in Córdoba have cancer deaths well above the provincial and national average as well – ranging from 180-201 per 100,000 inhabitants. 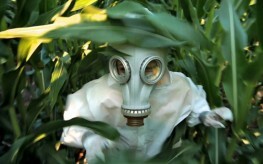 Cancer Multiplying ‘as Never Before’ Through Big Ag Pesticides. The ‘Report on Cancer in Córdoba 2004-2009‘ is the culmination of an official investigation that was prepared by the Provincial Tumour Registry and the Department of Statistics and Census; it is only its recent publication that has garnered worldwide attention and criticism from doctors and researchers toward the government who has delayed letting the public know its findings until now. He is not the only person who feels the cancer-herbicide link is strong. Dr. Fernando Manas of the Genetics and Environmental Mutagenesis Group at the National University of Rio Cuarto, is investigating the effect of agrochemicals on cancer rates as well. Researchers at Río Cuarto have studied the people of Córdoba for 8 years and have confirmed, in fifteen scientific publications, that people exposed to pesticides suffer genetic damage and are more prone to cancer. Despite these overwhelming findings, the government and the makers of these agrichemicals refuse to do anything about it. We all need to be equally adamant that governments everywhere disallow the use of these agrichemicals and GMO crop planting.